I used to be really paranoid that the chains would break on the swingset at school. It made lots of creaking an grinding sounds. Maybe it would be the horizontal tube above me that would crack. It is pretty rusty. I better keep my distance as I walk by. That other kid is swinging pretty high. I’m right in the target range for when the seat tears and launches him at my head. Today’s Maximumble saves the day. Yeah, that’s my luck. I can not use a swing without it breaking. Yeah, the equipment at the school where I grew up was pretty dangerous too. I remember when one kid ended up in the hospital. I really miss those days. Hm, Biff looks grown up compared to earlier strips this week. 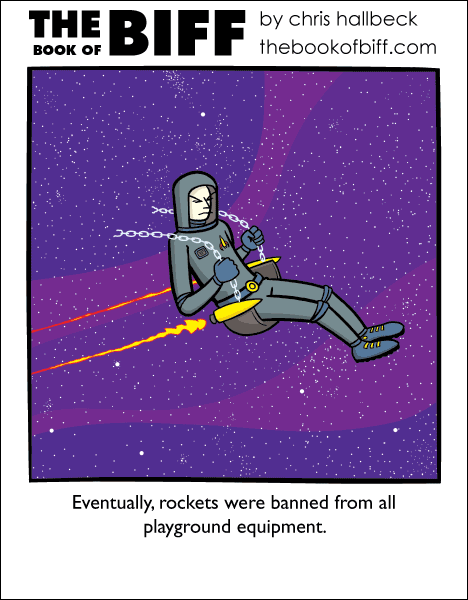 Did the swing snap years ago, and the life support system in the suit kept him alive all those years? I think the real problem was the merry-go-round pinwheel. Kids were hitting the chainlink fences hard enough to force-through in chunks. It’s mandatory to feel this way when on that swinging roller coaster ride.